Finished reading Life of Pi by Yann Martel. 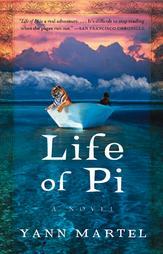 Life of Pi is about 16-year-old Pi Patel, the son of a zookeeper. Pi is raised in Pondicherry, India, where he attracts “religions the way a dog attracts fleas.” Planning a move to Canada, Pi’s father packs up the family and their animals and they hitch a ride on an enormous freighter. After a shipwreck, Pi finds himself adrift in the Pacific Ocean. Trapped on a lifeboat with a wounded zebra, a spotted hyena, a seasick orangutan, and a 450-pound Bengal tiger named Richard Parker. Gore and fighting ensue leaving Pi and Richard Parker the sole passengers on the boat. The two are stuck drifting for 227 days through shark-infested waters while fighting hunger and the elements. I enjoyed Yann Martel’s writing style. I found the book to be a slow starter but it quickly picked up. The end of the book leaves you hanging in a unique twist.